For as long as there have been fat kids with Gameboys (including yours truly, just to be clear), there have been efforts to figure out how to turn video games into exercise. Whether it was the venerable NES Power Pad, game-ified fitness apps, or just a million different iterations on Dance Dance Revolution, the living-past-50-minded have been trying to trick sedentary gaming lumps into applying their endlessly problem-solving, number-chasing brains to the problem of being healthy for decades now. There was just one problem with these endeavors (besides the fact that anybody with half a brain could figure out how easy it was to cheat most of those World Class Track Meet games by stepping off the Power Pad and hitting the buttons with your hands): Whatever tricks ended up being deployed, the players in question still had to deal with the fact that their lumpy, sedentary bodies were the ones being asked to do them. 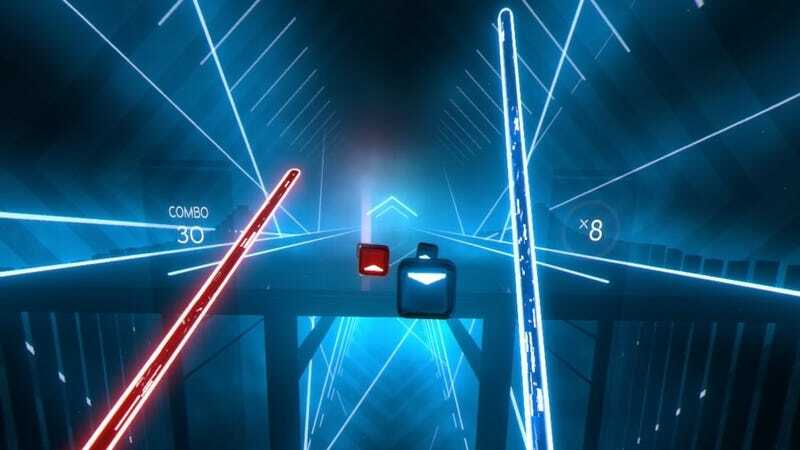 Which might help explain why Beat Saber—which just came out for the PlayStation VR, after months of longing looks directed toward the Oculus and HTC Vive owners already raving about it—is secretly one of the best fitness games ever made. Holding a twin pair of virtual light sabers, slashing at musical blocks in time with semi-listenable electronic music, and ducking under fast-approaching energy walls, it all feels amazingly real, not least of which because you don’t have to watch your own flabby meat husk make the motions while you do it. Instead, you’re an invisible digital ninja, swashbuckling tunes out of the air, racking up combos, and only idly wondering how ridiculously awful you look (or when the damn game is going to get some additional new songs, please). Like DDR—with which it shares a frustratingly high hardware cost, but without quite so much escalating-to-cruel complexity in terms of how it plays—Beat Saber works as a game first and an exercise routine second, even as you work up a sweat swatting down ever-more rapidly moving blocks, the Move controllers pulsing pleasantly every time your sabers connect. The key selling point of virtual reality, after all, is immersion, the sense that you’re both somewhere, and someone, else. And if it lets you pretend for a few minutes that you’re a person who actually gets a kick out of getting their heart rate up, well, who can say that’s so bad?